Viewing topic "Is the MOXF8 considered a professional instrument?" I’m a fulltime professional musician and considering purchasing a Yamaha MOXF8 but am wondering whether it’s more geared towards beginner/intermediate players? It’s features (and weight!) make it great value for money but I’m not sure I’m completely satisfied with the action. I already own an S90XS so perhaps I’m just too used to the action on it? I believe it is safe to say that the target demographic for the MOXF8 is professional and/or serious gigging amateur users. Whether or not the action suits you will be your decision, of course. 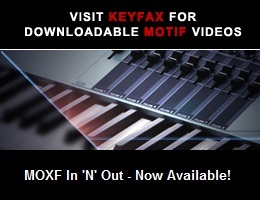 It has almost everything from the motif xf and some more than montage, the pattern sequencer. I play mine at payed gigs. I know more people doing so. It’s already been said, but you’re getting nearly all of the Motif XF’s features and a really nice light weight, all at a brilliant price. Plus, it’s a 2 in 4 out USB audio interface to boot. In the hands of a beginner, it will sound like a beginner’s instrument and in the hands of a professional, it will sound like a professional instrument. You make it what it is. I went from an S70XS to the MOXF8 and never looked back. Bought my MOXF8 used for 1K and it’s paid for itself many times over. Sent the S70XS down the road and don’t miss it at all. How do you all feel about the keybed/action on the MOFX8? I’m debating whether to get an MOFX8 or a Roland FA-08. I have an S09XS and I love the sounds and the action but the action on the MOXF8 didn’t do it for me the first time I played it...it’s hard to describe but the GHS action on the MOXF8 just feels a bit light/like there’s not much dynamic range in the keys...does that make sense? Maybe the dynamic range is more in the samples than the actual keybed and maybe I don’t know what I’m talking about haha. Thoughts? I’m no piano player myself and have a MoXF6, the different velocity curves makes a big difference on that one. Can’t you find a curve on the MoXF8 that’ll be close enough? Long time since I set it, but I think I have the ‘wide’ or something similar. I loved the balanced action on my S70XS but would find my hands getting tired at long extended gigs. Dehydration and playing style are all factors but with the lighter action of the MOXF8 I seem to be able to get through the longer gigs without issues. In a professional studio setting I’d take the balanced action in a heartbeat. In a professional gigging setting the lighter graded action works better for me. If you’re a full time pro, I imagine you play some combination of studio sessions and events. So what’s the nature of your musical workload? The curve is HUGE in making the piano voices sound like you want them to. As to the original question, I was in NYC a couple of years back, right after I had bought my MOXF8. We went and saw Beautiful on Broadway, and after the show, I peeked over into the orchestra pit. I saw 5 MOXF keyboards, bass, guitar and drums. I felt like I had probably made the right choice. The one thing that really made me scratch my head, however, and I still don’t really get, is the puny power cord and wall wart that this comes with - identical to the one that came with my Poly 800 back in 1983. It’s definitely not “professional” and I can’t believe I haven’t had to replace mine yet. I’m not a fan of those either, but only aesthetically. I know which I’d rather replace between a wall wart and an internal PSU. Sure, the wall warts are ugly and as you say, they look like they could break easily, but they are a breeze to replace and don’t cost too much. There would presumably be a lot of pain, down time and expense if an internal PSU went down. One potential disadvantage is that care needs to be taken so that excessive force isn’t accidentally applied to the cord. If that happens, sometimes the synth’s power jack or its connection to the p.c. board gets damaged, which would require servicing. Another disadvantage of the wall wart is that they are specialist and specific, so if you do break one (or forget it) and you need one in a hurry, you’re going to need to find a store that sells them, whereas, with the IEC power cables, you stand an excellent chance of finding a replacement quickly because they are much more abundant from all kinds of retailers.